We live in a world of maximum automation and instant gratification, with new apps, services, and devices designed to make our lives easier popping up practically every day. Sure, it can seem excessive at times, but the least we can do in this context is make the most of it and use these tools to our advantage. Think about it: if you’re using antiquated, manual marketing tools and strategies, it’s like operating on a patient without the latest labwork or equipment – you simply don’t have all of the functionality that many successful businesses use to thrive, and you could fall behind and lose patients as result. That’s why it’s important for all forward-thinking DPC doctors to streamline and optimize their marketing efforts with automated marketing. And don’t worry – it’s a lot more straightforward than it sounds. Let’s dive in. First thing’s first: why is automated marketing so important and what difference does it really make? Old-school, manual marketing is a very reactionary process by which doctors or their marketing teams are left having to craft each email and communication with patients after conversations begin. This doesn’t cut it today. Why? Timely responses: Customers today expect to get fast responses, and they’ll simply leave your site and go to a competitor if you don’t meet their expectations. A consistent brand voice: Consistency is key, and you want to create a voice and style of communication that your customers can recognize across your communication. And only automated processes can deliver these results. So what exactly is automated marketing? According to HubSpot, it’s the automation of repetitive, day-to-day tasks – such as emails, social media, and other website actions – in order to effectively nurture prospects and provide them with content that will turn them into delighted, returning patients. In other words, it’s using technology to run certain aspects of your business on autopilot so that you can really make the most out of your communications and focus your energy on the things that matter most. To be able to send the right message at the right time, and to make that message personalized, relevant, and effective without actually having to draft every email yourself. In the big picture, this not only increases the efficiency of your communication – thereby improving audience satisfaction, traffic to your site, and customer loyalty – but also allows you to focus your attention on large-scale efforts and strategies, thereby increasing your ROI and helping you grow in the long-term. By 2020, 85% of customer relationships with businesses will be managed without human interaction. Businesses who nurture leads make 50% more sales at a cost 33% less than non-nurtured prospects. Companies that automate lead management see a 10% or more bump in revenue in 6-9 months time. According to Marketo, Increasing sales revenue (53%), lead nurturing (43%) and customer engagement (37%) are the most important objectives of a marketing automation strategy. Yet, getting started can often seem easier said than done. In fact, according to Liana Technologies, the lack of expertise and know-how (55.6 %), as well as lack of human resources (48.1 %) are most common reasons why companies are not using marketing automation. This can be especially true for direct primary care (DPC) physicians. You didn’t study marketing, after all, so it’s natural for you to feel overwhelmed and wonder where to start. So let’s get over that hump and break it down. That said, the best place to start is with your emails. Here, the goal is to segment your audience and create targeted automated emails that are automatically sent to specific, curated lists or groups of people. Now, this may sound over-complicated, but the idea here is simple: you want to be able to communicate with your patients – and your potential patients – in a timely manner, and to provide them with information that they’re interested in. And you don’t want to send the wrong information to the wrong people i.e. send an email about cost savings to someone that really just wants access to their doctor. This automated email marketing process allows you to avoid such mistakes and send the right message to the right people at the right time – with no additional effort on your part. Welcome series automations should be sent to people at the top of your marketing funnel, a.k.a to new prospects that have just filled out an appointment form on your site or given you their information. This is super important: these people are interested in you and your services, and they want to hear from you while your business still top-of-mind. Email 1: This should be sent right away, and it should be triggered to send as soon as a patient completes an action of your choice (as soon as they click on a consultation request, fill out a contact form, sign up for a blog, etc). Welcome them to your business and provide them with valuable information that establishes you as an expert. From there, invite them to sign up for an in-office consultation or to take another form of action. This will move them along in the funnel and take them one step closer to becoming a patient. Email 2: Send this email a few days later, and include something helpful and relevant to the reason they signed up. For example, you can include a link to some “frequently asked questions” content, a discount on a consultation, or a blog on a specific condition or health concern relevant to them. The point, again, is to provide specific solutions to their pressing questions or pain points – or to provide offers that the patient might be interested in – so you can convert them from prospect to paying, long-term patient. The key with any of these communications is to make sure that they’re timely, super engaging, and ultra-personalized. These people have already shown an interest in you and your practice, which means they’re the perfect audience to convert if you get this part right. This workflow is for a completely different segment of your audience: existing patients that you haven’t heard from in a while. The goal, once again, is to maintain engagement and increase the know, like, and trust factor with your company. So choose the information or the offer that makes the most sense for your audience and interact accordingly. Finally, you can engage with your patients and site visitors based on specific actions they take on your website. This can not only keep your practice top of mind but also help ease any doubts or concerns that are keeping that site visitor from becoming a patient or scheduling an appointment. In that way, this kind of automation can really increase your return on investment (ROI) and expand your patient panel. 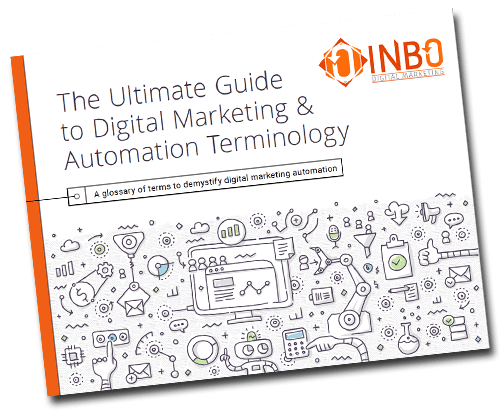 This guide will provide you with the key terminology used in digital marketing and an explanation of each to better understand the elements of digital marketing and the use of marketing automation.